Her comments, which just recently surfaced on Twitter, sparked renewed outraged. Hundreds of protestors showed up at the venue at the time in a pro-Israel demonstration for Rep. Omar’s prior comments that many have perceived to be anti-Semitic. For the record, CAIR was not founded in reaction to ant-Muslim backlash after 9/11, a reference to the Islamic terror attacks on September 11, 2001, which claimed the lives of 2,996 people and injured more than 6,000. As People’s Pundit Daily (PPD) previously reported, CAIR bills itself and is portrayed as a Muslim civil rights and advocacy group. But it was founded in June 1994 by two members of the Muslim Brotherhood’s now-defunct “Palestine Committee”. The Palestine Committee was created by the Brotherhood to advance Hamas’ political and financial agenda in the United States. Nihad Awad was one of those former committee members. He recently met with Rep. Tlaib in her office to water down a resolution denouncing anti-Semitism in response to prior remarks made by Rep. Omar. He currently serves as executive director for CAIR. According to federal investigators, he was a close associate of Hamas leader Moussa abu Marzook. 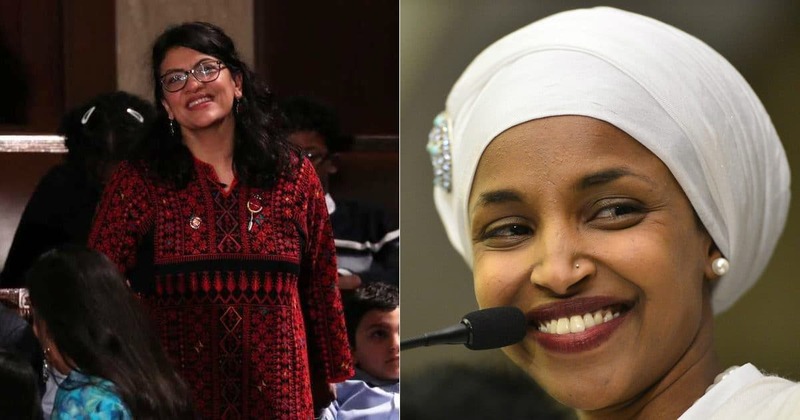 Representatives Rashida Tlaib, D-Mich., left, Ilhan Omar, D.Minn., right. HALLIE JACKSON: I know there’s something else that has been on your mind and a lot of folks’ minds, and that is some comments and some backlash now to Congresswoman Ilhan Omar, after some comments surfaced this week in which and I want to play it, she said something about the 9/11 attacks. I want to talk about your reaction to the backlash and your reaction to the comment in two pieces. So here is that remark, Congresswoman. REP. ILHAN OMAR (CLIP): CAIR was founded after 9/11, because they recognized that some people did something and that all of us were starting to lose access to our civil liberties. HALLIE JACKSON: And it’s that phrase, some people did something, that is being picked up on by some of the Congresswoman’s critics, including for example, the cover of the New York Post, which I’ll ask you about in a second. But on these remarks themselves, some people did something as a reference to 9/11, do you think she should have rethought her words? Do you worry about the appropriateness of that? REP. RASHIDA TLAIB: They do this all the time to us, especially women of color, they do that, they take our words out of context because they’re afraid, because we speak truth, we speak truth to power. My sister Ilhan Omar, what she was talking about was up lifting people by supporting their civil liberties and civil rights. She has always, always condemned any kind of strategy, especially of a person that is directly impacted by being a refugee herself. She sees what terrorism can do, she sees what violence can do to a whole country, to a whole people. Taking it out of context, this is just pure racist act by many of those, hateful acts, by those because she does speak truth, when it talks about different issues that they don’t disagree with and I’m really outraged. This is a pretty clear indication that Muslims view the events of 9/11 differently than true U.S. patriots. They cannot and will not condemn what occurred that day because form the Muslim perspective, those events were justified. Regardless of the race or religion, she downplayed a horrific event in American history. I have close friends that were there and still have ptsd from this “something”. It wasn’t something it was a tragedy of tremendous proportions. Nothing to take likely. As far as the anti-Semitic comments that she has said….making comments like “it’s all about the Benjamin’s” accusing our government of letting wealthy Jewish and Israeli line their pockets. Extremely offensive! I don’t care what color she is or what god she prays to. I believe she’s not fit to work in a government job where you must leave your personal beliefs and feelings about certain people at the door and remain neutral. There’s no room in this country for intolerance and no more room in our government for another hate monger stirring up everyday people who are easily influenced by a smooth talker in expensive business attire. There’s nothing racist or intolerant about disagreeing with her or finding what she has said to be offensive and insensitive. It seems like liberals and Democrats have been recently attacking the Jewish community and I am of Jewish decent. It’s disgraceful that our government hasn’t fired her. You can still be a tolerant person and disagree with what Ilhan Omar has been saying. I just believe that she’s wrong and that she’s been intolerant and I have the right to feel that way….as an American. The extremist creeps now elected are instantly busy gaslighting the public. It’s Jihad, mokes. THE PART, “ALL OF US WERE STARTING TO LOSE ACCESS TO OUR CIVIL LIBERTIES” IN THE SAME SENTENCE AS, “SOME PEOPLE DID SOMETHING”, CLEARLY ELEVATES HER AND”WE” AND “OUR” ABOVE THE THOUSAND KILLED AND THOUSANDS INJURES BY THE ATTACKS. I CANNOT IMAGINE THAT SHE WOULD NOT BE ABLE TO ANTICIPATE CRITICAL BACKLASH. PERHAPS SHE DID. PERHAPS SHE INTENDED TO COMPLAIN THAT THE IMPASSIONED CRITICISM IS EVIDENCE THAT FOLKS ARE PREJUDICED AGAINST HER. I CANNOT KNOW HER MOTIVATION, BUT SHE CERTAINLY COULD HAVE KNOWN IT WOULD STRIKE A RAW NERVE FOR MANY PATRIOTIC AMERICANS. I CRITICIZE EITHER HER IGNORANCE OR DELIBERATE RECKLESSNESS.